I am really happy with my purchases this month. 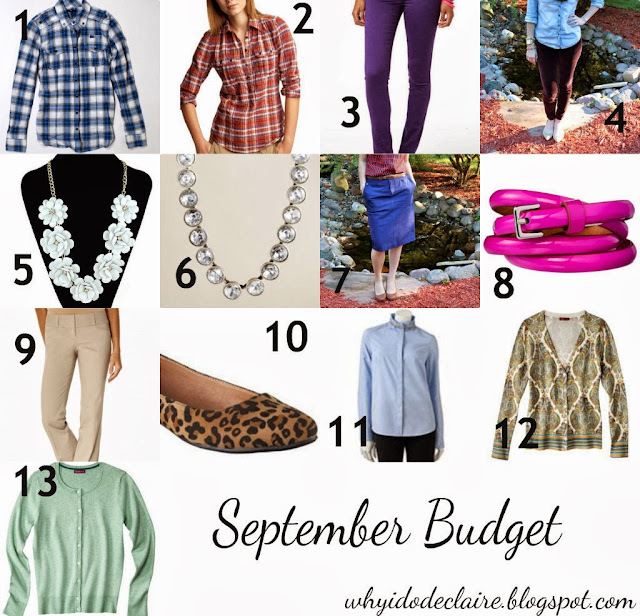 I got purple and burgundy pants, plaid shirts, and leopard flats that were on my fall wish list. I've also been wanting a mint cardigan for a while and was so glad when I found one at Target for a great price. A red cardigan, red scarf, a bow tie blouse, and a leather accented shirt are still on my list for fall/winter. I also need to replace some items including a cognac skinny leather belt, silver shoes (probably these), and rain/snow boots (I want dark purple or green Hunter boots so I've been trying to sock away some money each month). Sequined tops would be nice too, but I am waiting to see if this or this will be on sale at a better price. Holy moly good work Laura! I have heard so much about ThreadUp - you are making me really want to check it out! You did such a great job finding sales and selling old clothes! I can't believe you got so many things for so little money! Well, actually I just wrote a post last Tuesday about thrift shopping! :) I know Ginny at My New Favorite Outfit also has had some posts about thrifting (and making sure you are buying what you really like/need and what fits because sometimes the price can sucker you into buying something you won't wear). You really have to think about how it fits into your closet and matches with what you already have. I believe Sunday and Monday are half off a certain color price tag, too! Thank you! I always try to make my budget stretch! It helps I was able to sell some old items and there were some great Goodwill finds again this month. Thanks Kelsey! There were some really good sales this month! Or, there are probably other referral codes you can use out there, too! Thanks! The Goodwill near me had some great finds again. Seeing it all again makes me want to go shopping. Good thing my new budget starts tomorrow! Gosh, lucky you with these great steals!! I'd LOVE to get paid in shoes! Oh wow and I thought I got some good thredup deals this month, you got those shirts at a major steal! Wow! Some great buys and you did well at Goodwill and with ThredUp!! Wow, you did a great job this month too, Laura! I love, love, love the burgundy pants and paisley cardigan! The crystal necklace you got is simply gorgeous as well. Way to go!! Thanks Bri! As long as we get to pick what shoes we get paid in, it's a great idea! Maybe shoes wouldn't be considered taxable income either, haha! I was really excited I found them and with my referral codes, I basically only had to pay shipping! I am loving ThredUp! Thanks Carly! I try to check out Goodwill at least once a month and I've had pretty good luck so far! Not as good as $2 pants, but I was close! Thanks Brynn! You did so good and excellent deals too. Loving the Fall-colored Pants you got. And your plaid shirts are adorable. I need some myself. Also, I would love a Mint Cardigan. I have a cute one from Old Navy but it's getting too tight. I am dying over both of those necklaces and you got them for such an awesome deal. I want one of those Rose Necklaces sooooo bad. I's love the Mint or the Coral one. BTW, Girl, I cannot afford The Limited Dresses either. Not on full price. I always buy when they have sales, promotions or on clearance. Most of their promotions can be combined with coupons too so I do that. Thanks Ada! Plaid shirts have been on my wishlist for a while. Mint is such a great color and cardigans are perfect for layering, hope you are able to find one for yourself! I've wanted a rose necklace and finally saw it on eBay. Can't beat $10! Limited does have nice sales and coupons. That's how I typically buy things, too!